WINNIPEG — Ryan Dzingel likes to tease teammate Chris Tierney, but he was thanking him Saturday night. 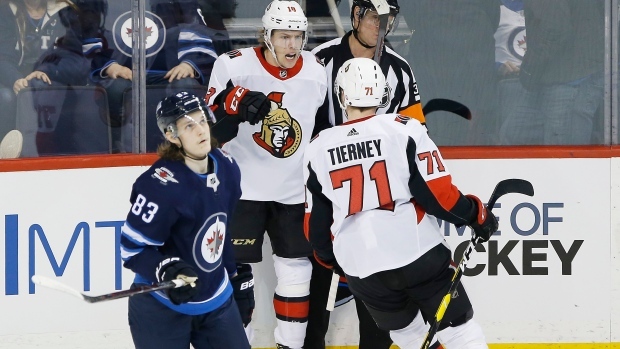 Tierney set up Dzingel's goal at 3:44 of overtime as the Ottawa Senators defeated the Winnipeg Jets 4-3 for their third victory in the past five games. "I put Tierney in a bad spot on the blue line and he chips it in and then makes a great pass," Dzingel said. "Like I joke around that he's skating at half speed all the time, but when you make plays like that you can skate as slow as you want." Mark Stone, Rudolfs Balcers and Matt Duchene scored power-play goals for Ottawa (22-31-5). Stone, Duchene and Dzingel also had one assist apiece. Tierney has six assists in a five-game point streak. Tyler Myers scored twice and Brandon Tanev added a goal and an assist for the Jets (36-19-4), who are 2-3-2 in their last seven games. Myers and Tanev each scored a short-handed goal. "We are concerned," Jets head coach Paul Maurice said of the poor stretch. "Going into tonight, it was the first five-game block of the season where we're under .500 at 2-3. So yeah, you're concerned." The losses include a 4-1 defeat against Colorado last Thursday and a 5-2 loss to the Senators last weekend. "Every team goes through a tough stretch at some point," Myers said. "We're facing a little adversity right now. We'll get our life back and finish (with) a good last 20 (games) here." Anders Nilsson stopped 23 shots for the Senators, who still occupy the bottom of the NHL standings. Laurent Brossoit made 37 saves for the Jets, a week after he was in net in Ottawa for last weekend's loss. Winnipeg led 2-1 after the first period and it was tied 2-2 after two. Myers scored his second goal, and seventh of the season, through traffic at 14:01 of the third to tie it 3-3. Nilsson then made a huge pad save on a close Blake Wheeler shot with just over a minute remaining in regulation. The game began with special teams in the spotlight. Jets defenceman Dmitry Kulikov was given a double minor for high sticking at 1:19, setting the stage for Stone's power-play goal 19 seconds later. Stone's name has been mentioned in trade rumours with the Jets. The Winnipeg native was asked if he heard a few chants of "We want Stone" from the crowd. He replied he didn't. When asked if he heard some cheers after his goal, he said, "That was my mom, I think, probably." The Jets replied to Stone's goal with Tanev's short-handed marker at 2:56. However, before Kulikov had fully exited the penalty box, he played the puck and was dinged for interference at 3:40. Tanev then set up Myers for his short-handed goal at 5:33. The 2:37 time span between the short-handed goals is the fastest in franchise history. The previous mark was 4:44 by the Atlanta Thrashers in 2003. The Jets had a pair of potential goals in the second period wiped out after reviews. A Winnipeg play midway through the period ended with a ruling the puck didn't cross the goal line when Ottawa defenceman Brady Tkachuk slid into the net with the puck alongside his body. After Balcers tipped in a Dzingel point shot at 13:53 to tie it 2-2, Jets defenceman Ben Chiarot scored, but Winnipeg was called for offside on the play. Ottawa ended the period with a two-man advantage that carried over into the third after Jets forward Mathieu Perreault was called for trip at 18:48, and defenceman Jacob Trouba went to the box for a double minor for high sticking at 19:16. The Senators capitalized with Duchene's goal 47 seconds into the third, with one second remaining in the two-man advantage. Duchene and Stone each have 27 goals this season. Winnipeg begins a three-game road trip in Colorado on Wednesday. Ottawa plays in Chicago on Monday. Notes: Matt Duchene has seven points (six goals, one assist) in his past six games ... Winnipeg was without defencemen Dustin Byfuglien (lower body) and Joe Morrow, who was put on injured reserve (lower body) after last Thursday's loss to Colorado.